On April 9, 2014 I was awarded my purple belt in Brazilian Jiu-Jitsu (BJJ). There are five belts, or ranks, in Jiu-Jitsu. You begin with white, then blue, purple, brown and finally black. How long you stay at any one rank depends entirely on subjective assessment from your instructor. Generally speaking, the purple belt is the level where a student begins to refine their technique and takes on more responsibility for assisting students of lower rank. The date of my promotion was just three days before the anniversary of my daughter’s death. I had a rough week. I almost didn’t go in to train that night. I was caught between those feelings of, “I want to be alone”, and “I want to be with friends.” The gym has served as my sanctuary many times and my teammates always have my back, so in the end I chose to go and train. Sure enough, the emotional turmoil of anticipating a day I wanted to forget subsided after rolling myself in a sweaty glow. About six years ago, a year and a half after I lost my daughter, BJJ found me; a broken-down, out-of-shape, grieving mother who had given up hope of ever being happy again. I had previously never participated in a martial art. Little did I know, but the tenets of this martial art, my coaches and my teammates would help me navigate the debilitating and unmapped road of my despair. BJJ was a new beginning, my beginning to heal. I reflected upon this when I returned home that night to do two things; (1) show off my brand-new belt to my family, and (2) place my blue belt above my daughter’s picture. 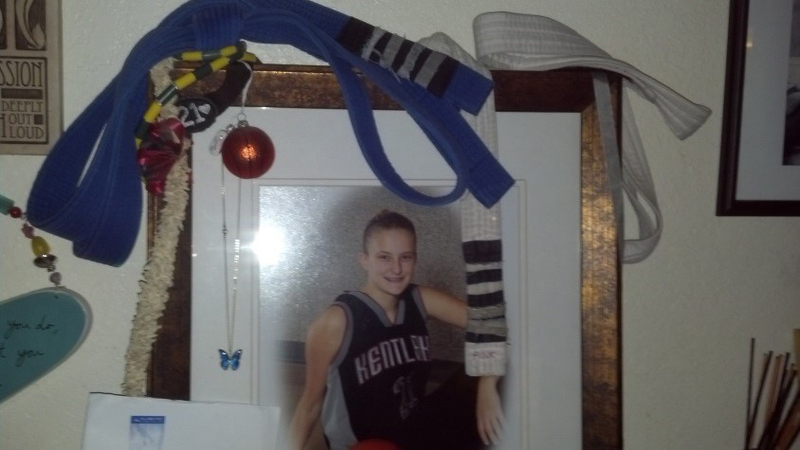 My blue belt sits beside my white belt, two symbols of separate yet convergent journeys. Surviving grief has taught me that every ending is a new beginning waiting to be noticed. 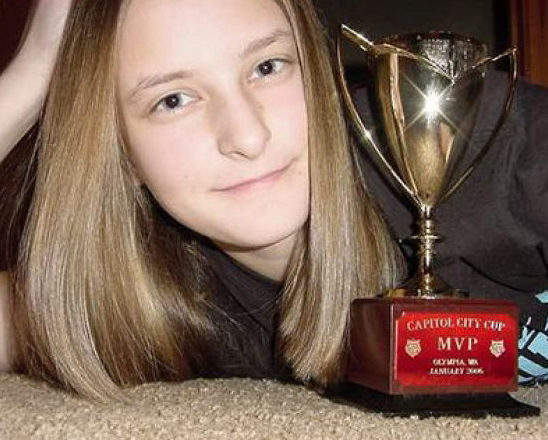 Manager’s Note: Carly Stowell collapsed and passed away shortly before her 15th birthday. She lives on in all our hearts.